Explore the possibilities of the digital world. Choose from eight creative degree and certificate options, including graphic, web and video game design. What is Graphic Design and Library Technology? Graphic Design and Library Technology has three tracks for you to choose from. Each track leads to a two-year Associate in Applied Science degree. Choose from Graphic Design, Video Game Design, or Library Information Technology. We also have certificate options available in Graphic Design, Video Game Design, Digital Video Editing, and Library Information Technology. Certificates consist of five or six specialized courses in the area of your choice. Are you interested in video game design, graphic & web design, or video editing? Learn all these skills and more in BCTC’s Graphic Design and Library Technology program! 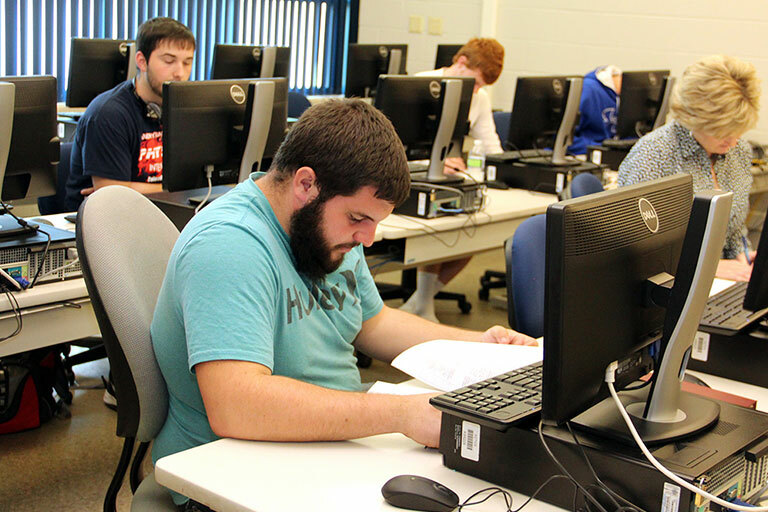 The Graphic Design and Library Technology (GDLT) program at BCTC prepares students for a career in design, with several specialization options for certificates or an associate degree. Students will learn how to use software from the Adobe Creative Suite, including Adobe Photoshop, Illustrator, InDesign, and Premiere Pro. Students interested in becoming graphic designers, web designers, video editors, or video game designers should check out the credential options in BCTC’s IMD program. Associate in Applied Science degree in Graphic Design and Library Technology with tracks in Graphic Design, Video Game Design, and Library Information Technology. The project-based courses in the GDLT program have assignments designed to simulate working with clients. Examples of class projects include filming and editing music videos, logo design, character modeling for video game design, and much more! Our instructors are connected to the local design industry, and AAS students will gain on-the-job experience through our required internship program. Classes are available in person at the Newtown Campus and online. $15 per hour for graphic designers with little to no experience. Whether you are a recent high school graduate or are working and would like to learn more about specific software programs, we can accommodate your needs. Even if you already have a higher-level degree, you can learn the concepts and skills required within your focus area and build a strong portfolio. ⓘBased on research conducted by the Kentucky Center for Statistics (KYStats) in 2017 for the BLUEGRASS LWA region. Focus area options in graphic design and video game design were recently added, and more information will be posted soon. Please contact Drew Hunt, andrew.hunt@kctcs.edu, with questions. The focus areas will allow you to complete an AA/AS degree with fifteen hours of electives in graphic design or video game design.